James Comey is a really stupid individual. Considering the legal jeopardy he must know he’s already in and with no guarantee that any political party would be likely to pardon him in the future, he has taken a plunge of absolute arrogance and nailed his future to it. Too bad it’s nailed to the legal equivalent of Jello brand gelatin. He may also count on the American people forgetting some of the most pertinent aspects of his career—which fell from its heights like a 747 with no engines, no wings, and only mountains in every direction for miles. So for those who might find it helpful I thought I’d identify just some of the more remarkable, and to date, many yet unaccounted for items that he probably dropped from his book (and which will likely not appear in his two hour sit-down with the former Clinton press-secretary who now pretends to be a journalist at ABC News). 1. CRIMINAL MISHANDLING OF CLASSIFIED INFORMATION: In his testimony before Congress (not long after his termination from the Trump administration) Comey revealed he had broken two important protocols when it came to the handling of classified information. He gave the original information (or copies thereof) to someone with zero government or security clearance. He admitted to as much under direct questioning when appearing before the Senate Intelligence Committee in June of 2017. He then instructed the non-cleared holder of said information to begin leaking elements of it to the press. In doing so he utilized information that was not his to use, and leaked pertinent evidence to the press that at the time was being investigated by both Houses of Congress, the FBI, the DOJ, and at that time no less than likely four major press outlets. His expressed hope was that it would trigger a Special Counsel investigation — which he knew would have wide latitude and would give investigators a chance to investigate the president simply because they didn’t like him, as opposed to investigating specific criminal charges. 2. HE DENIED LEAKING THE INFORMATION: While under oath before Congress, James Comey perjured himself when denying that he had ever in fact leaked any information to the media. Yet information specific to his notes were leaked to the New York Times. It also appears likely that Comey was responsible for another headline grabbing leak concerning a meeting only he and the president attended, and someone in that meeting then relaying to the press—again the New York Times—that the president wished the FBI to drop the investigation into Gen. Flynn. 3. MAY 2nd & 3rd 2016: These two days are particularly difficult, embarrassing, and inherently problematic for James Comey. On May 2nd, then Director Comey circulates an email memo to his deputy, the FBI general counsel, and his chief of staff. The email contained a draft of his final conclusions as gathered for the Clinton email case. But the Washington Post points out he had yet to interview 17 eventual witnesses; he had yet to interview Hillary Clinton’s chief of staff; he had yet to interview Hillary Clinton herself. This willingness to prejudge by that amount of yet-to-be-taken versions of events, and what should’ve been a hard-hitting dress down of the former Secretary of State, prove definitive bias. For this alone he deserved termination for violation of the FBI’s high standard of process. On the day following he makes another enormous misjudgment in allowing Paul Combetta—Hillary Clinton’s “bleach-bitter”—to be granted immunity, even though he lied to the FBI in his responses regarding his own interview pertaining to the emails. It’s important to point out that “lying to the FBI” was one of the substantive charges leveled at both Paul Manafort and Gen. Michael Flynn, but no such immunity was forthcoming. 4. WHY DID HE ATTEMPT TO CREATE A PR STUNT REGARDING RUSSIA: While having acknowledged that the amount of evidence that President Trump and his campaign having anything to do with Russia, collusion, and rigging elections was in essence a “nothing burger,” Newsweek reported that Director Comey desired to create public awareness and had drafted a plan that eventually was shot down by the less partisan voices of John Kerry, Loretta Lynch, and Susan Rice. 5. HE SEEKS TO PROFIT OFF HIS TESTIMONY: This week as the air date of his interview neared, Byron York of the Washington Examiner reminded my radio show on Thursday that while ABC News was leaking information about their yet-to-be broadcast special, there appeared a heavy inconsistency. ABC News bragged that James Comey answered “every question we asked him.” Yet when the Senate committee that oversees the FBI asked Director Comey to answer a few questions regarding their lawfully empowered investigation—he declined—citing the busyness of his schedule. For this alone he should be required to pay a heavy price in pathetic book sales, and backlash. 6. HIS DEPARTMENT WAS AN UTTER DISASTER: Friday afternoon the Inspector General for the Department of Justice released the first of multiple reports he has been diligently putting together to summarize his own investigation into the problematic instances at the FBI in recent years. The report found that under Comey’s leadership, his No. 2 Andrew McCabe misled multiple investigators over his role in a news media disclosure. He lied to investigators, he lied to Department of Justice senior leadership, and he authorized a leak to the Wall Street Journal. 7. 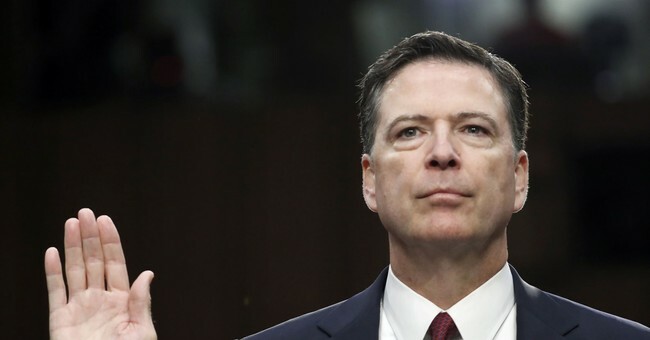 HIS OWN PEOPLE DISAGREED WITH HIS ETHICS AND PRACTICES: In the aftermath of his bizarre statement to the press regarding the Hillary Clinton email investigation, more than 100 field agents of the FBI, and roughly half a dozen attorneys from the DOJ, made public through a source their total disbelief and disagreement with his assessment. In a lengthy statement read to the cameras, Comey laid out as clear a picture of wrongdoing as could be made, before jettisoning the issue by claiming “no prosecutor” would’ve brought a criminal indictment and been successful. At the time—and before the 106 agents and attorneys who worked the case came forward—I had several notable prosecutors in New York City tell me face to face that they could’ve prosecuted it and won a conviction. There are possibly dozens more ways in which James Comey runs the risk of exposure in his continued public statements and by investigators still researching his public claims. It’s a stupid time to be acting arrogantly in public and when criminal prosecution lingers. It’s a stupid thing to continue poking a Justice Department, which had every right to fire you, knowing it could possibly take a second look at his own wrongdoing. Hubris, however, may be his ultimate undoing.